I’ve almost completely given up on the idea of RSS feed readers. Too much effort, too much management, too much to keep up with for the simple pleasure of being able to read a few articles by my favorite writers on the Web. That is until I started playing with Acrylic Software’s new Times for iPad app. Where other feed readers fail by assuming, incorrectly in my case, that I want to read every bloody thing written on someone’s Website, Times understands that, just as with a normal newspaper, if you miss a few days you’re not going to unwrap every issue and read all the articles you’ve missed. Times breaks your news feeds into four distinct categories, or “Pages”—Science, Technology, Arts & Entertainment, and Sports—and ships with several feeds already added so you get an idea of how the $8 app works. You can easily add to, delete, or re-arrange any of these Pages, although anything more than six turns the Pages navigation bar into a sliding list that you have to move back and forth in order to see all your Pages. Once you add all the feeds you want, Times displays only the most recent articles on a Website, giving you the option to view older articles if you choose. I Read the News Today, Oh Boy: Times for iPad breaks your feeds into four distinct categories—Science appears here—displaying recent articles in a newspaper-style interface. Times displays recent articles as headlines with a small snippet of the opening paragraph and—depending on your customization options—images from the site your feed is coming from. Tapping any article displays the article’s available RSS content and offers options for e-mailing the article, viewing it on the wWb, posting a link to Twitter or Facebook, and saving articles to your “shelf”—a collection of articles you’re saving to read later. While Times’ View on Web feature works well, it’s missing the View in Safari option that you find in most similar applications; it also would benefit from a “Read Later” link to Instapaper. 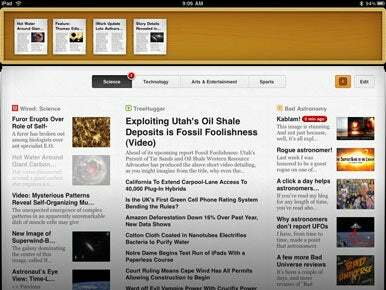 The app provides options for customizing much of how content is displayed within each of Times’ sections. You can add or remove columns, changing options for the number of articles that are displayed for each feed and whether or not images are displayed. To change the number of articles you see, Times uses a slider that, unfortunately, doesn’t provide any visual information for how many or how few articles you’re going to be viewing, which results in a bit of a slide-and-seek guessing game wherein you open the customization tool, move the slider, close the customization tool, count articles, and repeat as necessary. Sounds more like a formula for washing your hair than adding a few more news feeds. I was also disappointed that I had to use my iPad’s Settings app to change the size of the text used in Times. Times is limited in the way that most feed readers are. That is, if the feed you’re subscribing to only displays a summary for the article, that’s all you’ll see in Times. And, unlike Flipboard, Times doesn’t pull in information or photos from articles linked to within the feeds you’re subscribed to. So while it’s better than any other feed readers I’ve used, you’re still often relegated to opening two or more links before you get to read what you want to. Acrylic Software’s Times is a beautifully designed, intelligent feed reader that removes most of what’s frustrating about most RSS feed readers. With its customizable newspaper-like feel, Times does for RSS feeds what Flipboard does for social media sites, giving you newspaper-like access to the feeds you want in a way that’s fun and a pleasure to use.